The outbreak of the Korean War in 1950 convinced Western leaders of the growing threat of international communism. The United States began to encourage the Europeans–the FRG in particular–to contribute to their own defense. For Germany, five years after having lost the most devastating of all wars, this meant forming an army, a step unthinkable for many Germans. Germany’s rearmament was also anathema to some of its neighbors, especially France. As the Korean War continued, however, opposition to rearmament lessened within the FRG, and China’s entry in the war caused France to revise its negative position toward German rearmament. To contain a newly armed Germany, French officials proposed the creation of the European Defense Community (EDC) under the aegis of the North Atlantic Treaty Organization (NATO). Adenauer quickly agreed to join the EDC because he saw membership as likely to increase his country’s sovereignty. 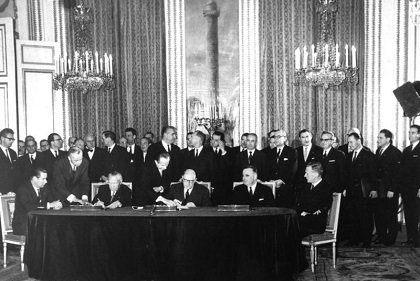 The treaties establishing the EDC were signed in May 1952 in Bonn by the Western Allies and the FRG. Although the Bundestag ratified the treaties, the EDC was ultimately blocked by France’s parliament, the National Assembly, because it opposed putting French troops under foreign command. The French veto meant that a new formula was needed to allay French fears of a strong Germany. The negotiations surrounding the planned rearmament of the FRG and the creation of the EDC provoked a Soviet countermeasure. After a second East German proposal for talks on a possible unification of the two Germanys failed because of the FRG’s demands for free elections in the GDR, the Soviet Union put forth a new proposal to the Western Allies in March 1952. The Soviet Union would agree to German unification if the Oder-Neisse border were recognized as final and if a unified Germany were to remain neutral. If the proposal were accepted, Allied troops would leave Germany within one year, and the country would obtain its full sovereignty. Although the offer was directed to the Western Allies, its content was aimed directly at the West German public and aroused lively discussion about the country’s future. Adenauer was convinced, however, that even if the Soviet proposal were serious, an acceptance of the plan would mean Germany’s exclusion from the community of Western democracies and an uncertain future. Together with the Western Allies, which did not wish to act without his consent, Adenauer continued to demand free elections supervised by the United Nations (UN) in all of Germany as a precondition for negotiations. The Soviet Union declined and abandoned its proposal. Adenauer was harshly criticized by the opposition for not having seized this opportunity for unification. As his impressive victory in the Bundestag elections of 1953 clearly demonstrated, however, Adenauer had acted according to the wishes of the overwhelming majority of West Germans. Adenauer’s decision to turn down the Soviet proposal was convincing evidence that the FRG intended to remain firmly anchored in the Western defense community. After plans for the EDC had failed because of the French veto, negotiations were successfully concluded on the Treaties of Paris in May 1954, which ended the Occupation Statute and made the FRG a member of the Western European Union and of NATO. On May 5, 1955, the FRG declared its sovereignty as a country and, as a new member of NATO, undertook to contribute to the organization’s defense effort by building up its own armed forces, the Bundeswehr. The FRG contributed to NATO’s defense effort by building up the Bundeswehr, an undertaking that met with considerable opposition within the population. For many, the memories of the war were still too vivid. To avoid separating the army from the country’s civilian and political life, as was the case during the Weimar Republic, laws were passed that guaranteed civilian control over the armed forces and gave the individual soldier a new status. Members of the conscription army were to be “citizens in uniform” and were encouraged to take an active part in democratic politics. Although West Germans generally remained less than enthusiastic about their new army, the majority accepted the responsibility of sharing the burden of defense with the United States and the other members of NATO. By 1955 the Soviet Union had abandoned efforts to secure a neutralized Germany, having become convinced of the FRG’s firm position within the Western Alliance. 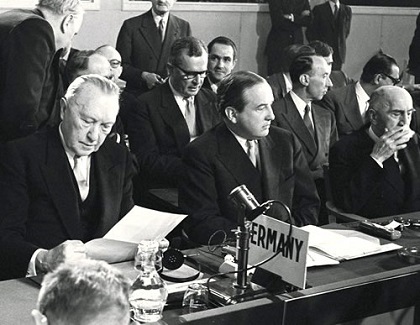 Following the Four Power Conference in Geneva in July 1955, Chancellor Adenauer accepted an invitation to visit Moscow, seeking to open new lines of communication with the East without compromising the FRG’s firm commitment to the West. In Moscow in September, he arranged for the release of 10,000 German war prisoners. In addition, without having recognized the division of Germany or the Oder-Neisse line as permanent, West German negotiators also established diplomatic relations with the Soviet Union. The Soviet Union had recognized the GDR as a state in 1954, and the two countries maintained diplomatic relations with one another. The FRG had not, however, recognized the GDR. And to dissuade other countries from recognizing East Germany, Adenauer’s foreign policy adviser, Walter Hallstein, proposed that the FRG break diplomatic relations with any country that recognized the GDR. The proposal was based on the FRG’s claim, as a democratic state, to be the only legitimate representative of the German people. The Hallstein Doctrine was adopted as a principle of West German foreign policy in September 1955 and remained in effect until the late 1960s. Another important development in the FRG’s relations with its neighbors was that the Saarland rejoined the FRG in 1957. 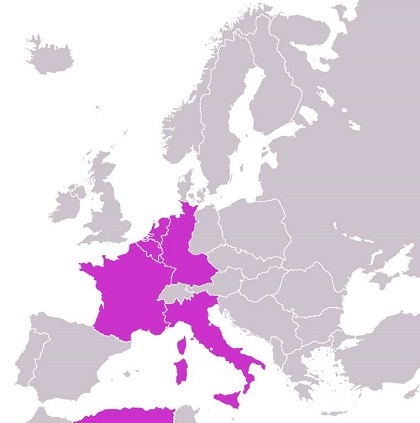 After World War II, France had attempted to separate this region economically and politically from the rest of Germany. In 1947 the Saarland received its own constitution and was virtually autonomous. During negotiations leading to the Treaties of Paris, the FRG and France agreed, in the Saar Statute, that the Saarland should become a territory under the control of the Council of Europe. However, in the referendum of October 1955, which was supposed to confirm the Saar Statute, Saarland voters rejected the statute by a two-thirds majority, an indication that they wished their region to become part of the FRG. On January 1, 1957, the Saarland became a West German Land. In addition to his success in building a close and firm relationship with the United States, another of Adenauer’s great foreign policy achievements was reconciliation with France, with which Germany had been locked in rivalry and conflict for centuries. In spite of remaining disagreements on the areas of European integration and NATO, a basis for the development of more normal relations between their two countries was forged upon a good personal understanding between Adenauer and French president Charles de Gaulle, who had assumed the French presidency in 1958. The German-French Friendship Treaty (Elysee Treaty), which went into effect in January 1963, called for regular consultations between the two governments, semiannual meetings of the chiefs of state, and a youth exchange program. The treaty was seen by many as a positive step in the history of a difficult relationship between the two countries. 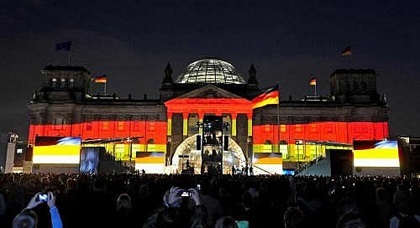 Of greater importance to the majority of West Germans, however, was the country’s relationship with the United States and its secure place within the Western defense community.